For NAATI Certified Bosnian translation services, your best choice is OPAL Translation. We are the leading Bosnian translation services provider in Australia. We provide English to Bosnian and Bosnian to English translations. When you work with us, we make sure your translations adhere to the strict standards of the country. We guarantee a 100 percent acceptance rate by authorities asking for NAATI accredited documents. We have the best Bosnian NAATI translators who strive to provide accurate and error-free results. Our Bosnian translations are 100% top quality. Expect that your document is the same or even better as the source document. Our experienced project managers make sure that you will only receive the best version of your Bosnian translation. Most often, we receive translation requests for documents such as birth certificates, academic transcripts, diploma certificates, marriage certificates, ID cards, driver’s licences, marketing manuals, technical documents, medical records, legal contracts and many more! Need a quote for your translation? We give FREE quotes. Just fill in your information in the translation form found on this page, and we will gladly provide you with an exact quote at no cost to you in just 15 minutes! Include a scan or photo of your document so we can give you an accurate quotation. No need to look for other Bosnian translation services. We have the fastest translation service in Australia. When you avail of our Express and Instant Bosnian translation services, you will receive your document in less than 24 hours! Let us know if you are in a hurry and want to avail of our Express and Instant Bosnian translation services. Get in touch via the Live Chat or leave us a message in the free quote form. On the other hand, our Standard Bosnian translation services take 2 to 3 working days. Make sure to let us know which you prefer. Here at OPAL Translation, we believe that Bosnian translation services don’t need to be expensive. For as little as AU $69, you will be receiving a NAATI certified, high quality, and fast Bosnian translation. We provide a FREE quote for your documents, just send it to us via the form on this page, and an email will be sent to you informing you of the exact quotation. Our pricing varies depending on the document’s deadline, subject, language and number of pages. Unlike the traditional Bosnian translation services, we provide online translations. There’s no need for you to waste your time going out, experiencing heavy traffic, and visiting our office. We make sure to provide our clients with convenient Bosnian translation services that they can avail anywhere and anytime. Want us to translate your document? Follow these easy instructions. Upon receiving your free quote, complete your order via PayPal or online banking. Credit cards are also accepted. A draft of the finished translation will be sent to you once your translation is completed. If you haven’t received any email from us, please check your SPAM box. We will be asking you to review the draft. If you are satisfied with the translation, the final certified soft copy will be sent to you via email. Inform us if you need a hard copy; we will gladly assist you and send you one via post. 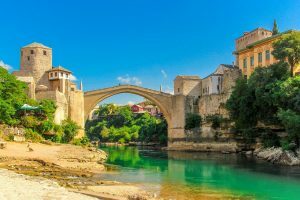 The Bosnian language sometimes called Bosniac or Bosniak belongs to the Southern Slavic language group. Included here are the Serbian and Croatian languages. It was created from the Latin language and believed to be derived from the Cyrillic script. Currently, more than 2.5 million people are speaking the Bosnian language. Since the Yugoslav Republic’s fall, the language has undergone a lot of changes.